Light rail transit bridge makes first connection to landside! There’s a lot of interest in the growing closeness of the deck segments on the Portland-Milwaukie Light Rail Transit Bridge. Today, a concrete closure pour on the westside bridge deck was made, and for the first time, it connected the deck to the west landside abutment. Later this week, the last permanent cables will be installed on the east tower. The overall 7.3-mile project is 70 percent complete. 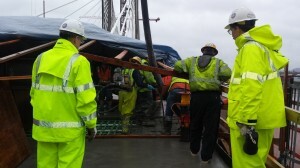 Crews pour a concrete closure pour on the Portland-Milwaukie Light Rail Transit Bridge over the Willamette River. The 1,720 feet long bridge deck is being constructed in 78 segments: 200 tons of concrete are poured into 16’ x 75’ segments make up the future roadway. This summer the bridge deck will meet in the middle over the Willamette River.